We are so confident with the performance of our "Carboncore" Model Clutches that we back them up with a Lifetime Warranty. That's right, Lifetime! After a decade of research and development, we kno w these clutches are virtually indestructable in a bike application. Our custom carbon-graphite blend material that's used on 600+ horsepower race cars has been applied to motorcycle clutches. We call it our "Carboncore" series, the finest motorcycle clutches the world has ever seen. 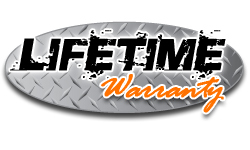 For as long as you own your bike, the Warranty is valid. We keep it simple, so there's no fine print for you to worry about. Just send in a copy of your receipt, fill out the registration card, and that's it!